Roche's MabThera is now available for mainstream use on the NHS in England and Wales to treat a rare autoimmune condition after receiving definitive backing from their cost-effectiveness watchdog. The National Institute for Heath and Care Excellence (NICE) issued final guidance this week that gave the green light for MabThera (rituximab) to treat adults with a rare condition known as anti-neutrophil cytoplasmic antibody (ANCA)-associated vasculitis. Coming in two forms - known as granulomatosis with polyangiitis (GPA) and microscopic polyangiitis (MPA) - the disease is caused by abnormal antibodies interacting with white blood cells in the body, resulting in the inflammation and damage of small blood vessels and can lead to organ damage and even death. The positive guidance comes eight months after an initial rejection from NICE and means MabThera becomes the first drug specifically recommended by NICE to treat the condition, which is estimate to be diagnosed in about 1,200 people a year in England and Wales. Prof Carole Longson, director of the Health Technology Evaluation Centre at NICE, described the improvements MabThera offers over current immunosuppressant therapies, such as cyclophosphamide, which have been used for 40 years. “These treatments are associated with substantial side-effects that can further impair patients' quality of life,” said Prof Longson. 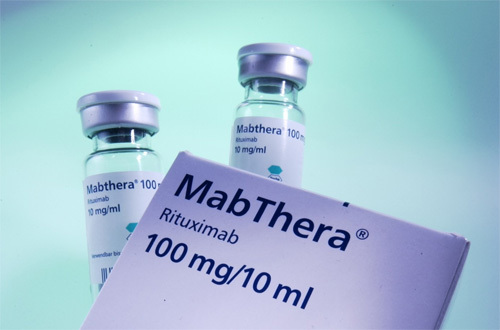 The guidance also allows Roche to expand the reach of MabThera beyond its current NICE recommendations to treat the cancers chronic lymphocytic leukaemia and non-Hodgkin lymphoma and the autoimmune disorder rheumatoid arthritis. There are some caveats to the recommendation, however, and MabThera should only be used under certain circumstances. This includes if more cyclophosphamide treatment would exceed the maximum amount of cyclophosphamide allowed or if cyclophosphamide is not suitable. MabThera can also be used if the patient wants to have children and treatment with cyclophosphamide may affect their fertility; if the disease has stayed active or got worse after a course of cyclophosphamide lasting 3-6 months; or the person has had uroepithelial cancer.